It was in 2008 that the Dainik Bhaskar Group came up with the 'Zidd Karo, Duniya Badlo' philosophy. It was their first national campaign since the company began operations in Bhopal in 1956, and featured their then brand ambassador, MS Dhoni, and was launched parallel to the Group's agenda of national expansion. Fast forward to 2016, and the Dainik Bhaskar group is one of the largest newspaper publication houses in the country. Recently, Dainik Bhaskar was also featured as the fourth biggest circulated newspaper in the world in the Wan- Infra World Press Trends 2015 report. Interestingly, despite a lot of changes at various levels, the group’s growth strategy has remained the same: believing in the importance of content then as well as now. Another constant has been its Zidd Karo philosophy, through which the group is trying to make a huge difference to people’s lives. That is why it has brought back the campaign this year. But this time, it does not have a celebrity brand ambassador to deliver its message to the audience - just a powerful TVC, conceptualized by ad guru Piyush Pandey. For Dainik Bhaskar, the thought behind the philosophy has been simple. They have tried to rid the word of its negative connotation by propagating the message that if you are stubborn enough to do something good, you should not listen to the world and hold your ground. This philosophy has perhaps helped the group see unprecedented growth in the past few years. As per the group’s Q3 results for 2015-16, its total revenues saw a 6% year-on-year growth at Rs 5,896 million and its circulation revenue increased 18% to Rs 1,141 million. Says Girish Agarwal, Director, Dainik Bhaskar Group, "We firmly believe in the Print medium. And so do investors worldwide who have a great confidence in Indian newspaper stories, which is evident from the fact that today the market cap of most of the listed Indian newspapers is much higher than their Western peers." Girish Agarwal, Director of the Dainik Bhaskar Group, talks to Srabana Lahiri and Samarpita Banerjee about increasing reader engagement, the basis of good content and why the Print medium in India will always grow bigger. What are some of the focus areas for the next year as a group? Our focus area for the next year is clearly Print and Digital. We will also be focusing on Radio because we have recently got 13 Radio stations in the last auction, and all these stations will be rolled out in the next six months time. We are also focusing on Digital where we already have 40 million unique visitors with us. However, our internal target is to increase this number by 50%. On the Print side, we want to increase circulation further. We are talking about adding another 3 lakh copies this year through various markets. What is the Group doing to intensify reader engagement, both on Digital and in Print? While we are doing multiple things to increase reader engagement, we are primarily driving it through our content. We are a very content-focused organization and at times go crazy about content. We do multiple things including training our journalists, that are typically not done by journalists or newspaper organizations. We are very happy with the positive response to such engagements. How do you ensure more advertiser engagement? When I have an engaged reader, I go to the advertiser and ask him if he would like to help me monetize it in a manner where the other person doesn’t feel offended. To put it simply, more engaged the reader, more engaged will be the advertiser. If my reader is devoting 30-40 minutes to our product every morning, the advertisers will also find their way to talk to the reader. At the same time, we also try to explain to the advertisers multiple ways of engaging with our reader because we know our readers more than anybody else. You have just launched the English language daily DB Post in your home market Bhopal. What does this signify? Are you going to look at English newspapers again? In markets like Ahmedabad, Jaipur, Indore, Bhopal and Chandigarh, there is a percentage of audience that doesn’t belong to that region. For example in Ahmedabad, as per our experience, the non-Gujaratis living in Ahmedabad can’t read Gujarati. Similarly in Chandigarh, there are a lot of people who are not Punjabis or not from Haryana, and these people prefer to read English newspapers rather than a Hindi or Punjabi newspaper. So there is a percentage of consumers in all these markets, roughly around 10%, who want to read English newspapers. So we thought why not even look at that 10% market. How are DB's Digital products different from those of its competitors, say for example Jagran's? A man is a man and yet we are all different from each other. Different people are present on the digital platform today and most of them are decently successful as well. Since you mentioned Jagran, I strongly believe there is a misconception in the market that Jagran is our competitor. I actually consider them as my peer group because they are doing some amazing work in UP, and that is their main ground. We don’t operate in UP. When it comes to Madhya Pradesh, Rajasthan, Punjab, Haryana, Chandigarh, Bihar, Jharkhand, Gujarat, I think we do something similar. We engage with our readers very efficiently and talk to them. So, in a way, there is no competition between me and Jagran or Times of India, Hindustan Times, because everybody is in their own territory and doing their best to engage the readers. You launched the DB mobile app in 2015 but operate mostly in Tier II and Tier III markets where getting good Internet speed can be difficult. How are you meeting that challenge? That is a challenge which the Government of India needs to work on. And they are doing a good job, I am told. We are waiting for new things to happen. I am told this year will see a huge improvement in the broadband and Internet connectivity which will hopefully help everybody. You recently launched a fashion portal, Fashion 101. Why a fashion portal? The idea behind such initiatives is to engage all kinds of readers. When we look at our readers, women form a big chunk. Many of them are fashion conscious and want to know about fashion. So in our entire offering, if we do not offer fashion, this huge chunk of readers will go somewhere else. Currently, we have also lined up around five more diverse portals that will be rolled out in a year’s time. 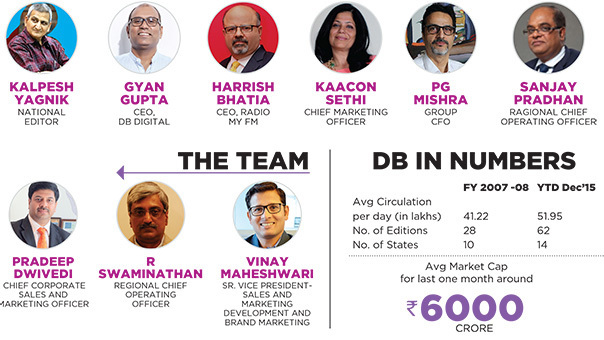 Dainik Bhaskar has a diverse talent pool in marketing and other departments. How have you harmonized their strengths to the best advantage for the group? Frankly speaking, the group owes its success to the contributions of the 12,000 people working for it. Today, our team comprises professionals from diverse fields. Every year, close to 300 new people join from varied places including the automobile industry, liquor industry, FMCG, Telecom and of course, newspapers. However, to integrate them into our culture becomes a mammoth task. But our HR team is doing a fantastic job. Many of your marketing campaigns have been awarded and celebrated. What makes these initiatives create so much buzz? Our thinking is simple. We believe you are communicating with an individual, a human, so there has to be an emotional chord. If you come and talk to me about something alien to me, or something superficial, I may not relate to it. But if you give me something I can relate to, can understand, like Unmetro, it works. We have been saying for the past 10 years that the Indian growth story is moving away from metros. One thing we have ensured in our communication is, we prefer not to talk about ourselves. This is a call we took in 2002 when Ogilvy Consulting did a big exercise with us on our group and suggested a few things. Then we decided that we won’t talk about ourselves unless we have to launch an edition. We moved towards talking about markets or something that would interest our consumers. How do you assess the performance and growth of My FM? My FM’s journey has been fantastic. I think they are outperformers in the overall setup, not only for us but in the industry as well. They have also crossed the Rs 100 crore billing mark. 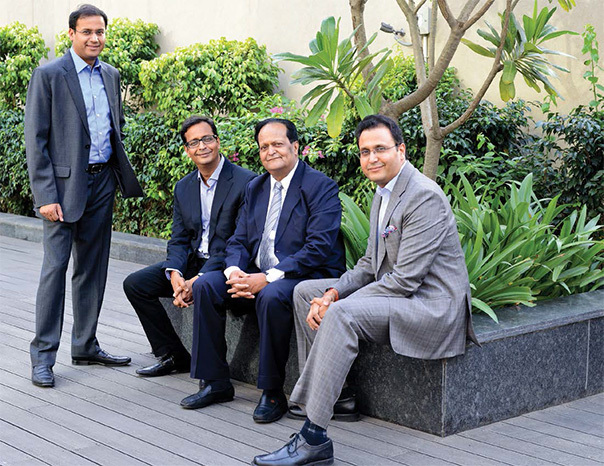 This year, they will become a Rs 100 crore plus company in terms of overall top line billing. Their EBIDTA margin is around 40% which is the benchmark for the industry. So they have done a fabulous job. When do you expect your newly acquired radio stations to start contributing to your bottomline? The work around them should be completed between September to December, following which they will start contributing to the topline. Maybe in 2-3 years, they will start contributing to the bottomline as well. Expanding business through acquisitions has been the way forward for some publication houses. Are you looking at anything currently? We are very open to acquisitions. We are very open to mergers, but if it makes business sense. I don’t really want to acquire some entity as if I am buying a painting for myself, because there is no personal win there. Whatever I am buying has to make business sense for me, and more than me, my stakeholders, who should feel that the price we paid for a particular acquisition had paid back well, and we are getting good returns out of it. One has to be very careful when it comes to acquisitions. So, wherever there is an acquisition opportunity, we evaluate it from our perspective, and if it fits in, we are more than happy to take it forward. But if it is not fitting in as per our requirement, then we are very happy to let it go. What do you think are the challenges that the Print market faces today and what is the next big thing in Print? Print as an industry is facing two challenges. One is an internal challenge. The industry needs to change its mindset of calling themselves a print organization. Instead, they should consider themselves to be a news organization. Secondly, the bigger challenge is that 75% of industry revenue comes from advertising. And currently, advertising is dependent on the growth of a particular client or a particular market. It also depends on how the market is growing, how the economy of the country is doing, and how the client is doing which is another challenge. If India is not growing at a GDP of 7-10%, if more cars are not being sold and more cars are not being bought, that becomes a challenge for us. India needs to continue growing and showing better numbers to help us grow. However, this factor is external and we can’t do anything about it ourselves. So that is a larger challenge. Other than that, we have regular challenges like how to acquire new customers, how to acquire a new client and how to grow. Do you think the younger generation is moving away from Print? Let me put it this way, despite being from the newspaper industry, when I was in Class XI, I never used to read newspapers. Most people in those days started reading newspapers after entering college. More people developed the habit once they started working. Frankly speaking, to say youngsters are not reading newspapers now is a fallacy because they were not reading newspapers even then. In fact, I would say that today, the younger generation’s involvement with news is better than it was earlier. The only difference is that they are not reading the paper version, but are reading my digital app. But when it comes to the core audience, which is between 24 and 50 years old, a group that was reading less newspapers in those days, they are more involved now. If you compare the readership penetration of 15 years back and today, it has almost become double. I am happy that a youngster who was not even connected to me 15 years back now has the digital medium to be connected. What are your expectations from the IRS? IRS is planning to do something and has got consensus from most of the stakeholders. Hopefully, the report will be out by the end of this year. We are hopeful that everything will go in the right direction because as an industry, we do need a currency. What is your Zidd in terms of the Group’s business? What do you definitely want to achieve? My zidd for the company is twofold: one to ensure that we give readers a well-rounded experience. We have been doing a lot of things around that and you will see many more coming up in the days ahead. Coming to the business, we are a listed company and have a responsibility towards our stakeholders also. Our zidd there is to ensure that we have the best of return to investment, return to equity, return to capital to deliver to them which means more profit and more cash reserve. That is the Zidd we are working on currently. Another very important Zidd for our employees is to provide the best working environment to them. They should enjoy coming to office and should feel a sense of pride working here. That is a big responsibility upon us. Sounding confident about the future of Print despite talk of the invasion of the Digital medium, Agarwal says that Print is here to stay. He says that more and more investors are increasingly looking at investing in Hindi newspapers, which is a positive sign for the industry. “Print as an industry is growing, and so is an investor’s interest in Indian newspapers. Currently, a couple of newspapers are planning to file their Draft Red Herring Prospectus (DRHP) as they want to go public. This is important because one of the parameters to judge the strength of the industry is to look at how a financial investor is viewing that particular industry. Evolution is a very important aspect. If an investor says that he is willing to buy shares of a particular newspaper company at a multiple of 12, 15 and 20, it indicates that he has confidence that this business is going to grow even further,” says Agarwal. Another matter that gives Agarwal proof of the popularity of the medium among consumers is that the Group has increased its circulation despite upping the cover price of newspapers. “Another important and noticeable aspect today is that newspapers across the country are increasing their cover price. When we had started off, Dainik Bhaskar used to be sold at Rs 1.5-Rs 2, which has now gone up to Rs 4. If in spite of increasing the cover price, I am able to increase my circulation, it goes on to say that people are really happy with newspapers. Why else would someone pay you more and still buy more?” asks Agarwal. Talking about the signs that predict a steady growth of the medium, Agarwal mentions the Wan-Infra report, in which Dainik Bhaskar was the only Indian newspaper to figure in the Top 5 list, with the Times of India finding a place in the Top 10. However, Agarwal predicts that in a few years, more Indian newspapers will become a part of the list as circulation of Indian newspapers seem to be growing at a steady pace. “This year, two of the highest circulated newspapers according to Wan-Infra are Japanese. It’s easy to guess why. Japan, unlike India, has only one language whereas India has so many different languages and dialects, and therefore, newspapers in different languages. However, going forward, I feel there will be more Indian newspapers in the list of Top 5 or Top 10 publications in the world, because the circulation in India is growing fast. Even the ABC report shows that most of the Indian language newspapers are growing by 3-5%. While the growth of English newspapers in the country is stagnant, Indian language papers are seeing growth every year,” adds Agarwal. Not only is Print seeing a year-on-year increase in circulation numbers, Agarwal says that around 40% of the country’s total advertising spends go to Print. However, he feels agencies need to approach the medium differently. “Today, a large chunk of advertising goes to Print but most of the creatives are being designed for TV and later adopted for Print. That is where the effectiveness of Print advertising takes a toll. It’s important for creative agencies to start thinking of Print as a strong vehicle that is growing. They need to start considering Print as an independent industry and need to appoint separate copywriters dedicated to Print,” he says.